The water was low at the park, but not as low as the parking space supply. The number of bridge-blocking logs, however, was well above ideal. 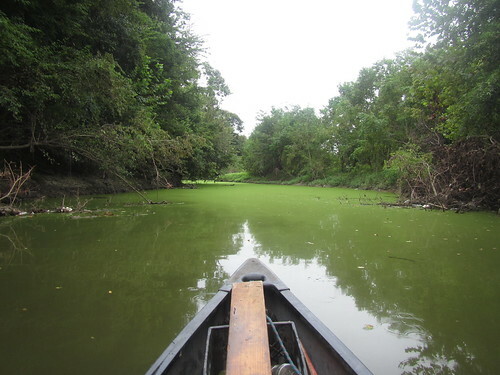 In fact, there wasn’t a single spot where the canoe bottomed out all the way down the bayou. I’ve got the biggest shallows area marked on the GPS receiver, and I recognized it even in its well-watered state. The downstream-right side was completely and easily passable. There was almost no work to be done all the way down the bayou. Just a few little catches and one slightly larger one way down at the half-mile mark, pictured above. Since it was only about 10am, I figured why not press on toward Ward Creek, where we’re having next weekend’s cleanup. It was a nice paddle down Bayou Manchac to Ward Creek, where I turned and headed upstream to check out the bridges. Heading upstream, there’s Highland Road, Barringer Foreman Road, the derelict bridge by Buzbee Drive, I-10, Pecue Lane, and Siegen Lane. 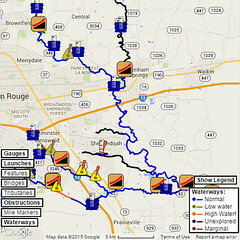 (If there’s enough water, you can even get halfway between Bluebonnet and Essen before you hit an impasse.) Highland Road wasn’t obstructed. 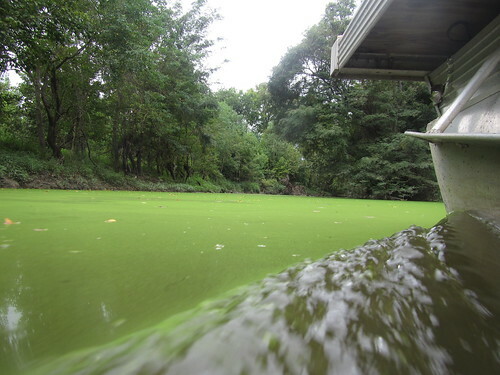 Barringer Foreman had most of one bay open with minimal problems. 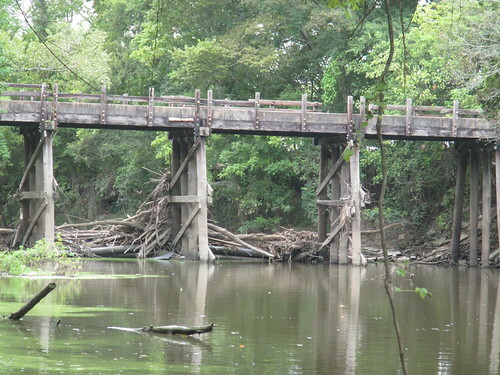 The derelict bridge, on the other hand, was not passable for more than a canoe. It would require a bit of work. I-10 was fine as usual. Pecue Lane, on the other hand, was well and truly blocked. At the current water level there was no way through, even with just a canoe, although a mere half a foot more water would be plenty for paddling. Oh, and there was also the slight issue of Ward Creek smelling rather… sharp… right in that vicinity. Having already called for reinforcements (i.e. Jonathan with power tools and his pontoon boat), I turned and headed back downstream to meet him. While I paddled down to meet up with Jonathan, I did some scouting and grabbed a few pieces of interesting litter from the water and banks. 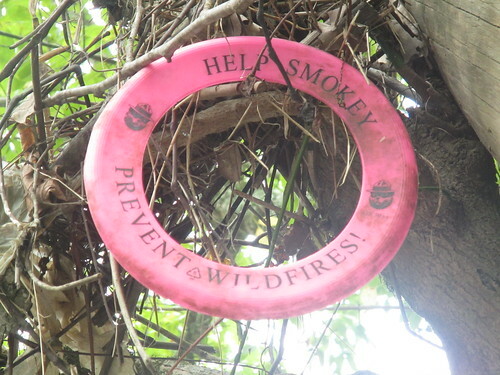 (Remember, only you can prevent bayou fires!) 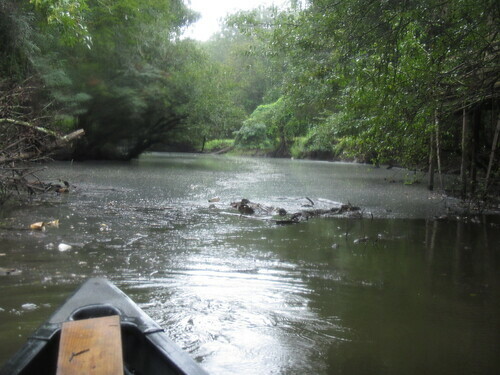 There’s currently a very large amount of floating litter in one relatively short section of Ward Creek not *too* far upstream from Bayou Manchac. 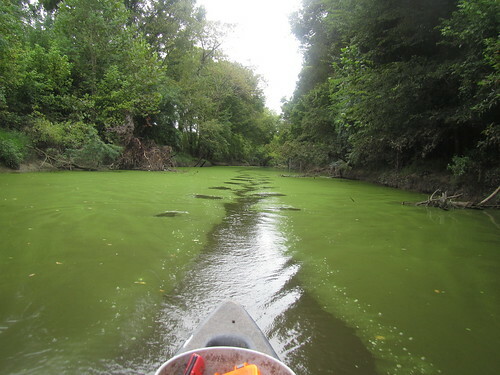 I’d really like to do a paddling cleanup there, but it’s a long way from any good access. Once there’s a paddle launch at Airline Highway Park, it will be much easier to get to, but that, like the future launch at Highland Road Park, is in a holding pattern while some park features are shuffled around. We’ll have paddle launches as soon as they can get everything worked out, and in the meantime, we’re keeping them informed about all the paddling going on in spite of the at times difficult access. I met up with Jonathan right around the Ward/Manchac confluence, hopped onto the pontoon boat, and tied off my canoe behind it. While I’m a paddler first and foremost, it was rather nice to rest my overworked and sore right elbow and enjoy the breeze as we headed back toward the problem bridges. We made it through Barringer Foreman without difficulty, and the derelict bridge yielded the right of way with not *too* much work. Pecue, on the other hand, used up the day with more wood remaining. If we had a bigger chainsaw, we could’ve wrapped it up, but it should make way with one more volley. It was a productive day on the water, with Bayou Fountain clear and easily navigable and multiple Ward Creek bridge issues worked. With just a bit more work, Jonathan should be able to get the pontoon boat up to the Ward Litter Banks near Siegen to support the litter cleanup Sunday, September 21st, from noon to 4pm. Next weekend should be fun, with the usual Bayou Fountain run on Saturday morning (likely turning into a long-distance trip all the way toward Siegen, at least for me) and the cleanup on Sunday. We’d love to have you join in for any of it you may be up for (and if you happen to know any good rain dances, you can show us after the cleanup).